Are you a planning or design student interested in learning how to create more inclusive, open and democratic landscapes? Then participate in the LED Program – an exciting way to earn credits and strengthen important professional skills. The LED course 2019 includes 13 online course sessions available to students at any institution. Our course will start again on April 3, 2019. Our information materials for the upcoming 2019 course are currently being updated. 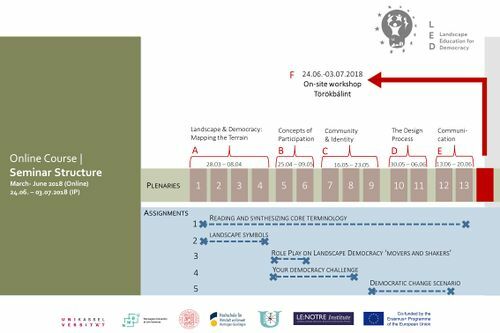 The online module consists of twelve 90-minute sessions of lectures, reading materials, collaborative group work, concept mapping, storyboarding and other diverse active and passive learning tools. More information can be found in the detailed course schedule. The seminar starts on Wednesday, April 3, 2019 at 16 30 pm CET. The seminar group will meet regularly on Wednesdays between 16 30 - 18 00 CET. There are no registration fees. Participation is possible in two modes. LE:NOTRE Institute, an international foundation based in Wageningen, Netherlands. This page was last modified on 1 April 2019, at 21:00.